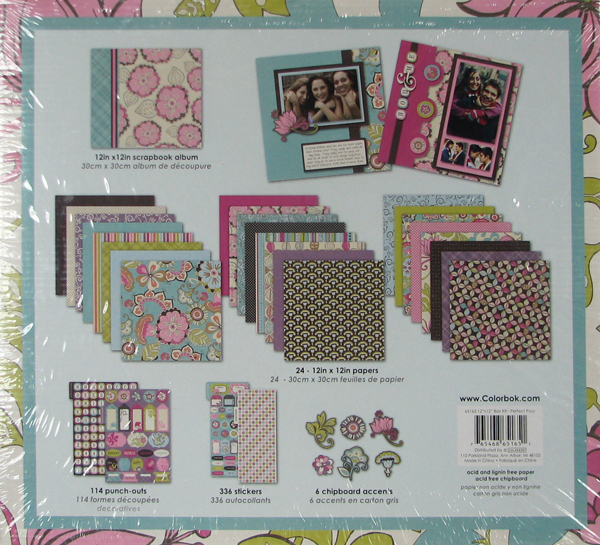 Today is the last day on my Scrapbook Room Clean-out and Giveaway. Thanks for joining me over the last week. I have had fun sharing with you as I organize and get my room put together. I am not quite done yet (still a couple of stacks of paper to deal with...hehe). Hopefully I will have my new desk done in the next couple of weeks....I will share photos of my completed space when it is all done. Thanks for the wonderful comments you have been leaving me along the way. I am so happy to hear that I have inspired you in some way to get your rooms organized. It is my *favorite* part because my kids can be in the room with me and I can even craft and supervise when they are doing their homework. I bought this little table (unfinished) from the clearance section of a craft store a couple of years ago. My husband finished it for the kids last year and I just moved it in here for them to use. I used the left over piece of peg board for some of their tools from the one that was cut from the huge piece that I bought at Home Depot for my peg board. I also cleaned up and hung a cork board that has been sitting in our garage for a few years for them to display their creations on. The corner shelf is one that I picked up at a yard sale years ago and was in my old crafting space. I know that they will find many hours of enjoyment crafting along with me.....which is one of their favorite things. For my last giveaway I have this Complete Scrapbook Kit by Colorbök along with this lovely box of silk flowers by 3 Birds. 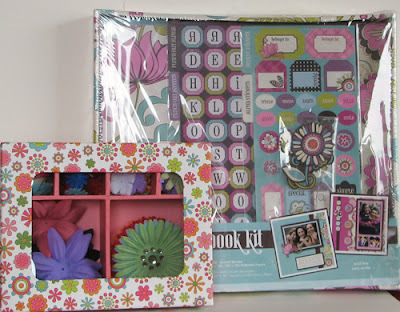 This scrapbook kit has over 460 pieces and includes an album. LOVE the kids' area! What a fantastic idea! And you know I love to scrap with a friend. Say, a good friend I only get to see twice a year? And maybe one of those times is coming up soon?! I have a wonderful friend i scrapbook with we met through work and bounce ideas off each other its so much fun! I think its great u involve your kids in crafting too! I have been a follower and enjoy your blog! What a great idea to have a kid corner! I scrap in the downstairs family room where I can supervise the kids playing (when they are awake). Once my husband gets around to refinishing my "new" scrap table, I'll be reorganizing just like you! 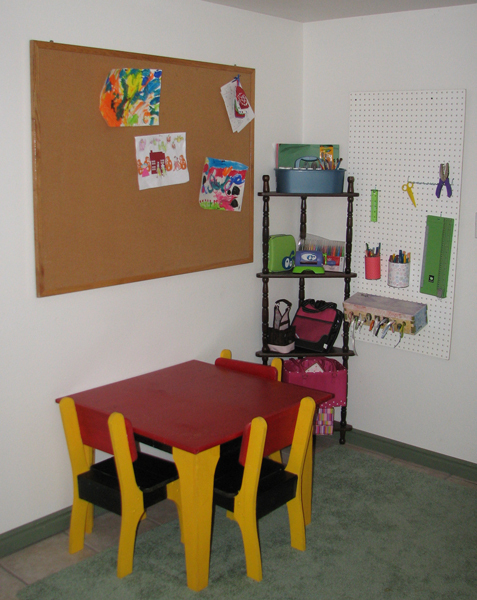 oh how adorable i think its great that your kids have their own space in your craft room. Your kids area is great! I know my grandkids like to come in my room and "make something". I have only ever crafted alone so I don't know if I would like crafting wuth someone. I do like feedback on my projects so I would probably enjoy it!! I love this! My kiddies are too old to craft with me any more :( But when they were little we were always making stuff. I like to craft with others, but there is no one here to craft with, so alone it is. Oh, I wish my area had the space for a kids area! How cool. I love to craft by myself or with my kids, as long as they can work on their own for a little bit. However, most of the time my 4yo and 6yo want to be climbing up on my lap and it is hard to work the cricut and stamp that way LOL! My kids area is my favorite part too. My daughter loves to do crafts, but is still a little young and needs major supervision. I love being able to craft with her and do my own thing at the same time. Thanks again for the ideas and the giveaways from this week! Amy I am so proud of you! I love the kids corner, can't wait until we have room for that for Caitlyn! I like to scrap alone, but that is only because I hate packing things up! What a great giveaway. Love your kids corner, I really need to invest in a large cork board! I enjoy scrapping with others when working on LOs, and by myself when making books or other projects. Great blog, thanks for the chance to win!! Kids love to craft. It is so cool that you have a corner their size. It really is so cute. I like to craft alone, with a buddy and even a skype buddy. Thanks for the chance to win. How exciting! I usually craft alone but it is so much more fun when I do get to have a crafty buddy over. Ohh i love the kid's craft corner! Too cute! I like to scrap with friends but we end up talking too much and I don't get as much done. So I think I would rather do it by myself. Love the giveaway week and the reorganization!! The kids area is wonderful! I love to scrapbook with my family and friends but I never seem to get a lot done as I am talking too much. When I really need to get things done I prefer to be myself. My little one loves to craft also, too cute. That is such a cute idea. I'll have to remember that when I have kids of my own. For now, my dogs just lay around where ever they please :) I like to craft by myself usually. My mind is only thinking 'craft' so it's sometimes a bothersome when someone else is there. That would be my favorite part too! My kids love to "help" me and this would be perfect for them to do their own thing while I did mine. Thanks for sharing. I love to craft with friends I just find it hard to find time to get together in a group setting so for now I craft alone. Eine tolle Idee mit der Kinderecke. Ich bastel immer gerne mit meinen drei Freundinnen zusammen. I like to scrap with my boyfriend. He's always reluctant to start, but when he gets going, he comes up with so many great ideas! I craft alone or with my kids during their vacations. It seems to me that no one crafts here as there are no crafting materials available other than card stock in limited colors and there's lace, ribbon & sequins as they are used for clothing. For the most part I craft by myself. I love to craft with my bff when we can coordinate schedules. Recently my sister has gotten into scapping so we get together about once a month. Love your new digs!! I craft by myself because i live out in the country and there is no else around. I do watch alot of tuturiols, that keeps me company. I love your scraproom. tfs and enjoy your room. What a great giveaway! Let's see...I like to craft with friends, but I don't get a lot done when I do. ;o) So, I usually craft alone. BTW, I'm a follower! Have a great Saturday! I like scraping with others, I love being able to interact with others and sharing. However, if I am on a mission and have limited time and a deadline to meet, I would rather work by myself and stay focused...humm, what does that say about me...LOL! Love the kids area! Great idea! It depends on what I am working on whether or not I like crafting with friends or not. If I am just crafting on cards and other projects, I love doing it with friends. 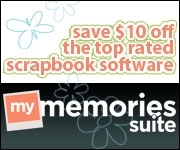 But, if I am working on my scrapbooks I do better if I don't chat the whole time. I tend to talk more than actually craft. :) Thanks for the chance to win! I love what all you have done. That is a great idea... I love the colors you chose for the table!! Great idea to have a special area for the children...great colors too! I usually scrap with friends. We try to get together at least once a week...they are a great inspiration. I have an area in my craft room for my grandkids just like yours. It is a great idea. Hi Amy...I'm a follower now! It depends on what I have to get done...I love to scrap with friends, but I don't seem to get as much done - more talking than scrapping. If I scrap alone I get more accomplished. I choose to scrap alone most of the time, but once or twice a month I get together with a group of women who like to scrap, and then about once a month I hang out with a good friend who scraps. We usually end up talking more than we scrap! That is why I prefer to scrap alone, because I get a lot more done. I love both! Sometimes it's just nice to go in my room, turn on some music that I like, and get lost in my own creativity. But it's always fun crafting with a friend, somebody to give you feedback and just some quality girl time. Although, I usually tend to get more done when I'm scrappin' by myself! I love how your reorganization is coming along. The kids' corner is a great touch! So much fun!! I usually scrap alone - get more done when I don't stop to chit chat. I always craft alone...well, I am in the living room with my hubby, but it's not as though he contributes! I would love to have a group of people to craft with, but I doubt I would get much done! ohhh I love your kiddies area, lovely bright colours too! I usually craft alone, but I think I would like some crafty company now and then! Amy, what a FANTASTIC idea! I love it! I love crafting with other people and try to go to as many group craft days/nights as possible! I just went on a 4 day scrapbooking retreat! It was FAB! I love how your room is coming together! Kudos to you for doing all the hard work! Thanks for all the great prizes this week! I usually craft alone but I like to wrangle hubby & the kids for holiday projects. When I craft with my friends we share ideas and I get a lot of inspiration, but I prefer to actually do the creating part of things on my own - just because I'm more creative and productive then. I'm sure your kids enjoy their craft area! I usually craft alone but I enjoy crafting with family and friends whenever possible. I LOVE the idea of a kids craft section! Now for a bigger house... haha! Your kids corner is so cute! I craft alone, in my dining room, when hubby isn't home. Having a space for your children to craft in your area is awesome, their interest will help keep this honny alive. My kids enjoy scrapping with me too. As far as your question goes it depends on the situation. I only know a couple people who are just starting out in scrapbooking and I find it hard to scrapbook with them because it is usually at my house using my stuff so I end up spending alot of my time finding stuff for them because it is mine and I know where it is or helping them put their page together so I don't really get anyting done. So if I want to scrapbook and actually accomplish anything in my los I need to scrapbook alone. It would be different probaly if I had someone to scrapbook with that has their own supplies that they bring and their own style/ideas/ability to make their own pages. It would be awesome to share ideas with someone who has an opinion not just 'yeah that is good' no matter if it is good or not. Thanks for an awesome week of chances to win some awesome prizes. What a neat corner. I know my nieces love to craft with me. What a cute kids corner! I like to craft alone, so that I can really spread out!! !